Graduate student guard Lauren Chase is averaging 6.6 points in 205 minutes of action this season. It’s no surprise that GW’s most powerful weapon, yet again, is rebounding. In seven straight games this season, GW has won the rebounding battle with senior forward Jonquel Jones leading the charge underneath. But the Colonials have been dominant off the glass even in their two losses, most recently to Wright State in the finals of the Lone Star Showcase after wins over Houston and No. 25 Iowa, showing that while rebounding is the team’s calling card, the Colonials need to take advantage of those extra opportunities by taking good shots. There’s been very little difference in rebounding in GW’s wins and losses. In wins against Grambling State, American, Fresno State, Houston and Iowa, GW won the rebounding margins by 25, 20, 1, 23 and 15. In losses to Stanford and Wright State, the team still won it by 4 and and 11. More telling is that GW shot 29.4 percent from the field against Stanford and 37 percent from the field against Wright State, two of the team’s three worst shooting games of the year. That’s not to say that the team’s performance off the boards has not been important. Shooting a high percentage isn’t as critical when the team gets extra chances through offensive rebounding. The Colonials amassed 132 offensive rebounds in the past seven contests to opponents’ 70. In both the Houston and Iowa contests, that’s helped GW notch a higher percentage of points in the paint. GW got about 50 percent of its points in the paint in those contests, in which the Colonials notched 37 total offensive rebounds and got 29 second chance points. 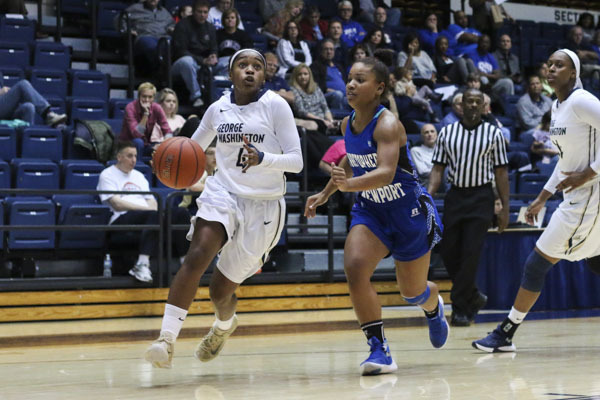 Having stability in the post position, whether that be from Jones, sophomore Kelli Prange or junior Caira Washington, has presented some challenges for defenders and allowed GW to capitalize in the paint. “A lot of teams don’t know how to guard us because we are so versatile, which I think will really help us down the line,” Prange said. That willingness to crash the offensive boards helps mask some shooting trouble from the perimeter, as it helps the Colonials get easy shots in the paint. In the Wright State contest, GW went 0‒10 from the perimeter. Tsipis said that his team needs to find a balance between taking risks from long-range and settling for a predictable jumper. If they can do that, the Colonials will be in very good shape with a diverse array of weapons on offense because the team’s rebounding numbers have been historic. Jones leads the pack with 105 rebounds so far this season, marked by her record-breaking performance against Iowa on Friday. Jones posted 26 rebounds, surpassing the program record of Jessica Adair who held the title with 21 rebounds in 2007. Washington trails Jones with 61 rebounds. With Jones and Washington assuming most of the responsibility, head coach Jonathan Tsipis said that everyone needs to adopt a hunger to chase the ball especially when opponents strive to minimize Jones’ impact. Jones currently ranks third in nation in rebounds per game, averaging 15.0. GW ranks ninth in the nation with a rebounding margin of 14.1 per game and 13th with an average of 19 offensive rebounds per game. GW returns to the Smith Center on Thursday to compete against Florida Gulf Coast at 7 p.m.